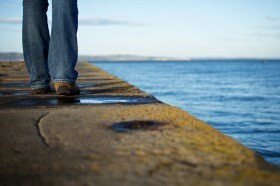 I often see people strolling along the pier and stopping for a moment or two of contemplation. I set out to try to recreate these moments in my photography today. Thanks to a willing model (aka James) and a low sun, I managed to get a set of shots that I was pretty happy with. I’m convinced that this year has seen a growth in the number of fishermen (and fisherwomen) hoping to catch their tea off Granton Harbour. 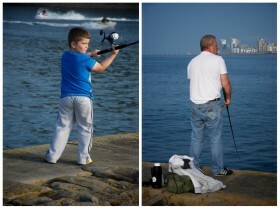 Its lovely to take a stroll and see the mix of people – kids, families and groups of friends – gathered along the pier.